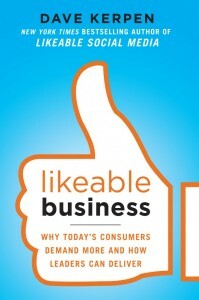 Dave Kerpen is a speaker, CEO of Likeable Local, chairman of Likeable Media and New York Times best-selling author. Helping brands, organizations and people everywhere be more likeable. Here’s what we spoke about on our recent interview. Adam Franklin: Hello viewers. My name is Adam Franklin. I’m here in Australia, and I’m very pleased to be here with Dave Kerpen from New York. He is the CEO of Likeable Local, the Chairman of Likeable Media, and the most trafficked LinkedIn influencer, ahead of people like Bill Gates and Barack Obama. He’s also the author of “Likeable Social Media,” “Likeable Business,” and “Likeable Leadership,” which I’ve got on my Kindle App. Thank you for joining us Dave. Dave Kerpen: Thank you for having me and g’day. Adam Franklin: G’day mate. Recently you’ve written about the fact that only 7% of Fortune 500 CEOs are on Twitter. What’s your advice to CEOs? Dave Kerpen: You know, the world has changed very quickly, and you’ve got to catch up. Now I’m not saying that CEOs need to be tweeting every day all day, but you’ve got to join Twitter to understand the cultural phenomenon that has changed the world in the last few years. You’ve got to join Facebook and social networks to understand the atmosphere that your customers and your employees and your vendors are all living in. There’s no way to be told all of these things and understand it the same way that you’ll understand it if you use the tools and the technology yourself. Adam Franklin: Dave, who are a couple of example CEOs that people can look to as inspiration? Dave Kerpen: Good question. So in Fortune 500 CEOs or just CEOs in general? Dave Kerpen: Okay. So, one of my favourite CEOs is a guy by the name of actually, leadership, Jim McCann and Chris McCann from 1800Flowers.com. They’ve done a really phenomenal job. Also, not a CEO, but Scott Monty of Ford is in their leadership and C-suite. He’s done a very good job. Obviously, Sir Richard Branson has done a very good job on LinkedIn, as well as Twitter. Rupert Murdoch, believe it or not, has joined the social media space and is very active on Twitter. I would look to a lot of the CEO and CMO of GE have done a very good job on LinkedIn. So there are examples. There are perhaps more examples than you might think of folks that are using social media well, particularly Twitter and LinkedIn. Adam Franklin: Dave, you’re currently the most trafficked LinkedIn influencer and of people like Sir Richard Branson. Now, can you please explain to our viewers and the CEOs amongst the viewers, what is your advice on becoming a LinkedIn influencer and what is the benefit? Dave Kerpen: Well, so unfortunately, the LinkedIn influencers, they’re not accepting a lot of people. Last I heard they had a wait list of over 50,000 people. I keep bringing my CEO friends and author friends to LinkedIn, trying to get them in, and I’ve only been able to get one person in. She is one of the hosts of a show on Fox called “Shark Tank.” She’s one of the sharks. Her name is Barbara Corcoran, and she’s a real estate entrepreneur. I think they’re only accepting Fortune 500 CEOs and heads of state right now. So unfortunately, my advice is become a Fortune 500 CEO or run a country. I just consider myself very, very blessed and lucky to have been accepted into the program a while ago when obviously they had much, much lower criteria before. Adam Franklin: That’s very humble of you to say. And now what sort of results have you seen as a result of being a LinkedIn influencer? Dave Kerpen: Oh we’ve seen about a million dollars in direct business for this year, thousands of leads. But this biggest way that it has made an impact, beyond the revenue and beyond the leads, has been the network of people that I’ve been so fortunate to get to know, some of the brightest, most talented, most influential and networked people in the world that I can now count as my friends and colleagues thanks to the influencer program. Adam Franklin: Dave, finally, where can people go to find out more about you and how to become more likeable? Dave Kerpen: Well, I would invite everyone to connect with me on any and every social network. Probably the best is Twitter @DaveKerpen, just my name. And you can connect with me on Facebook or LinkedIn as well. And then, of course, if you want to read any of the books, you can go to LikeableBook.com or LikeableLeaders.com and you can learn more about our companies. If you want to learn more about our company, just Google “Likeable.” You’ll find us everywhere. But I don’t want to sell you. I just want to connect with you, and hopefully I can help your readers and your viewers. And feel free to connect with me anytime. Adam Franklin: Thank you so much for your time Dave. Dave Kerpen: My pleasure Adam. You have a super likaeble rest of your day.